CW3 Watterson was born and raised in Cassville, New York. He enlisted in the United States Army in August 2001 as a 14E, Patriot Fire Control Enhanced Operator/Maintainer. 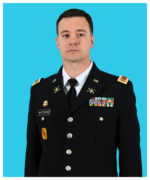 Chief Watterson was appointed as a Warrant Officer in March 2009 as a 140E, Air and Missile Defense Systems Tactician/Technician. CW3 Watterson’s assignments include Systems Maintainer and Tactical Director’s Assistant, 5-7 Air Defense Artillery (ADA) in Hanau, Germany; Systems Maintainer and Tactical Control Assistant, 4-5 ADA at Fort Hood, Texas; Air and Missile Defense Systems Technician, 6-52 ADA at Osan Air Base, Republic of Korea; Battery Trainer and Tactical Control Officer, A-4 ADA at Fort Bliss, Texas; THAAD Standardization Officer, 11th ADA BDE at Fort Bliss, Texas; Foreign Military Advisor, United States Army Security Assistance Training Management Organization in Abu Dhabi, United Arab Emirates; and Air and Missile Defense Planner, 32d Army Air and Missile Defense Command at Fort Bliss, Texas. His deployments include Operation Iraqi Freedom and the first operational deployment of a THAAD Battery to Guam. CW3 Watterson has completed numerous military schools and is a graduate of the Air Defense Artillery Warrant Officer Advanced Course. He currently holds an Associate in Applied Science Degree in Military Technology Leadership from Thomas Edison State College. Chief Watterson’s awards include the Meritorious Service Medal (3 Oak Leaf Clusters), Joint Service Commendation Medal, Army Commendation Medal (2 Oak Leaf Clusters), Army Achievement Medal (1 Silver and 1 Oak Leaf Cluster), Army Good Conduct Medal (2 Awards), National Defense Service Medal, Global War on Terrorism Service Medal, Global War on Terrorism Expeditionary Medal, Korean Defense Medal, Noncommissioned Officer Professional Development Medal, Army Service Ribbon, and Overseas Service Ribbon (Numeral 4). Chief Watterson and his wife, Kristine, currently live in El Paso, TX with their daughter Ada.